Other hilarious non-binding promises China has offered to implement by 2029 wouldn’t be tied to U.S. retaliation, Bloomberg's sources said. 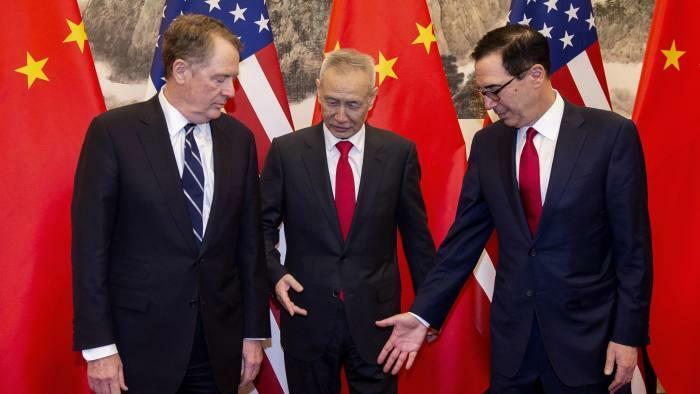 And now that a "bogey" for the 2025 target has been set, the talks are continuing in Washington where Chinese Vice Premier Liu He began planned meetings with U.S. Trade Representative Robert Lighthizer and Treasury Secretary Steven Mnuchin on Wednesday. The goal over the next few days, Bloomberg reports, "is to strike an agreement on the core issues so President Donald Trump and Chinese leader Xi Jinping can hold a ceremony to sign a deal." To achieve that, Lighthizer, Mnuchin and Liu held a working dinner Tuesday night, according to one of the people. In other words, some sort of announcement is practically assured; the only problem is that - thanks to the stated 2025 deal implementation target - this would fall of Trump's second term (assuming he wins re-election), in other words both sides implicitly admit that any deal is a sham for all practical purposes, and all that would happen is to give markets a brief, last minute push higher, as the entire US-China trade war episode is put in the rear view mirror. The problem for Trump is that should he sign this joke of a "deal", the blowback from both his core base and Democrats, which will both immediately see right through the hollow facade of the "deal", would be violent. Bloomberg does not help by noting that "the limited time frame raises questions about how much a deal would reshape the longer-term economic relationship, rather than simply serve as a political win for Trump that would last through his potential second term as the 2020 election campaign kicks off." BBG adds that "while some progress is being made, resolving more contentious issues such as intellectual-property protection is taking longer." Actually, if Trump signs this version of the deal, it virtually assures that there would be no IP protection at all and once Trump is gone, China will revert to its old "reverse engineering" ways. One final issues to be decided is what will happen to the tariffs the two sides have imposed on about $360 billion of each other’s goods in the past nine months. Trump has suggested that at least some of the tariffs will stay in place, saying they are necessary “for a substantial period of time” to ensure Beijing keeps up its end of the bargain. And since Beijing has absolutely no intention to keep up its end of the bargain, look for this US demand to be quietly struck from the "to do" list of demands, as Trump is now just focused on one thing: how to get the S&P to new all time highs driven by the naive belief that it is the level of the S&P that will be critical in getting him re-elected, instead of being perceived by his core constituency as having folded promptly under Chinese pressure, an outcome which would almost assure Trump hands over the 2020 presidency to whatever socialist is running from the other side. And with that, we sit back and wait for the 2025 round of US-China trade negotiations which will be led by Emperor for life (and death) Xi, and comrade Alexandra Ocasio-Jones of the American Socialist Democrat Party. We are confident they will be delightful.